The Caribbean isn’t the first place I’d go looking for bartenders on the cutting edge, so I didn’t really expect to be that impressed when we wandered into Grande Cru for their $5 happy hour martinis. The plan was to stop in, try a drink or two, and head over to the happy hour next door and grab some dinner. Three hours later, and more than slightly tipsy, I’d tried some of the best and most interesting cocktails I’d had in quite some time. Grande Cru’s master-mixologist Adrian is responsible for most, if not all of the drinks on the cocktail menu and the many infusions you’ll find behind the bar. And after more than 16 years of bartending, this guy knows what he’s doing. 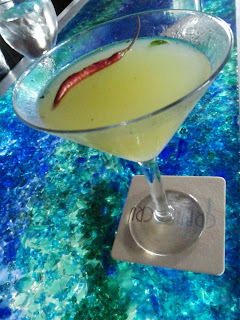 My favorite drink, and the decision was difficult, was the Samba, a spicy cocktail with a base of house infused chile pepper vodka. Shake that up with fresh basil, mango puree and fresh lime juice, and you have magic. After you take a sip you'll first taste the mango, sweet and fruity; next you get an intense blast of heat that wears off in just the right amount of time, leaving a hint of basil for last. My second favorite (tied for first place) was a fruity margarita made with a strawberry and mango house infused blanco tequila (Lunazul, I think) and a splash of orange juice. This simple description doesn't do it justice, so let me just say, it's like a party in your mouth. A house party. Honorable mention goes to the Birdland, with its combination of pineapple and cilantro, and a splash of cranberry for sweetness. Most unexpected surprise—a shot made with cheap beer and cognac—who knew? Adrian whipped up a round of these tall shots made with a couple ounces of Coors and a splash of vanilla cognac (I’m pretty sure it was Navan), for the Coors and Heineken beer execs and bigwigs. This was my local celebrity experience. The shot is still without a name, despite my pestering the aforementioned bartender, but it tastes a lot like a grape cream soda. I should also mention a drink called the Strawberry Blond, if only because it made Beta Wife exclaim, “it makes me feel like I’m six!” – referring to her recollection of a childhood Strawberry Shortcake doll, not the alcohol consumption. My favorite part of the drink was the fact that it gets shaken with a big lump of strawberry Jell-O. Though I’m a strict non-pink beverage consumer (no Cosmos for Alpha Cook), I thought this cocktail was mighty tasty and nicely balanced by the lemon juice. Take comfort in knowing we tried all these drinks in two visits, not just one. Although both times we showed up with an empty stomach, the second time we had a few snacks to offset the damage. We sampled a some of the appetizers: the lamb kefta, served with a sauce made from red peppers, walnuts and garlic, and the bread plate, to soak up all that liquor. Wish I had pictures for you, but the munchies won in the end. I only wish I could be a Friday regular forever. Check out the menu and happy hour specials at Grande Cru. For the record, Felicia has seen you drinking pinkish cocktails, the Countrypolitan, to be exact. A comso made with bourbon, guaranteed to put hair on your chest with just a hint of girlie sweetness. So admit it, Alpha: Even you like pink sometimes.